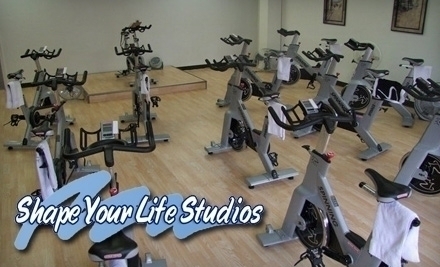 TEST RIDE: Shape Your Life Studios – Suburban Grand Rapids / Wyoming – …it's all about Studio Cycling! This week Wednesday morning I managed to drag my beaten down body out of bed (not yet fully recovered from my FLEXcity Flex56 workout) to check out the 6AM hour Spinning (r) class at Shape Your Life Studios in Wyoming (in the SW suburbs of GR). SYLS has been in operation for about 4 years. Here’s a brief recap of the studio and class. I first learned about SYLS while checking out the Spinning.com resources. SYLS is an Official Spinning Facility…using Spinner NXT cycles, Mad Dogg certified instructors, Spinning Energy Zone-based ride profiles, and as also been a host studio for Mad Dogg Athletics/Spinning training. Their web site is loaded with information about the studio, class schedules, rate information, instructor profiles, educational resources and helpful links. No on-line booking resources, but phone and email contact details to connect with staff. I talked with Kathy, the co-owner (with her husband) about the schedule and available classes for the first timer. Classes are offered 7 days a week, early mornings and evenings. And, like many others, first class is FREE. I arrived with the instructor (Lindsay) about 15 minutes prior to check things out and complete all the standard paperwork for a first timer. SYLS is not just a cycle studio…but primarily a personal training studio for women only. Details about the personal training program are covered in the YouTube video below. The studio is open to both men and women when it comes to Spinning classes. This is truly a full service Spinning studio, even more so than FlyWheel: just under 20 Spinner NXT bikes, towels, water and Polar heart rate monitor/chest straps provided for all riders…just show up with your own ride wear and shoes. This class was less than half full, but plenty of energy and socialization among the regulars at this neighborhood studio. Lindsay got things rolling on schedule and set the stage for your classic Spinning-style class: Good music, low lights and even special lighting effects timed with the ride profile and pace of the music…unlike anything I’ve seen at any other studio. Today’s ride was focused on a STRENGTH theme, one of the five Spinning Energy Zones (Recovery, Endurance, Strength, Interval and Race Day). Throughout the hour-long ride, Lindsay stayed on her bike, but frequently queued and prompted riders along the way. There were frequent reminders about heart rate, cadence and flywheel resistance level. Really enjoyed Lindsay’s music choices…lots of alternative rock (Green Day, Linkin Park, Non Point, Seether and more). By the time class was finished, I had burned between 700-800 cals, with average HR between 75-85%. So happy I finally made it to SYLS after hearing many good things from friends and coworkers for the past couple of years! At $10/hour long class, this studio is a great value. Personal training is also just $10/hour…much less than others in the area. I love hearing your reports on other studios. As I’m in Michigan, and a Mad Dogg/Spinning instructor also, I would love to go visit this studio some time. Thanks for the note Bonnie. It’s great to get off the instructor bike and just go along for the ride in other studios once in a while. Are you in Jackson? I’m an instructor at SYLS and I can say that this is a very special place. So glad someone took the time to report on it! Pingback: Cycling INSIDE the City 2019 – Grand Rapids, MI – …it's all about Studio Cycling!